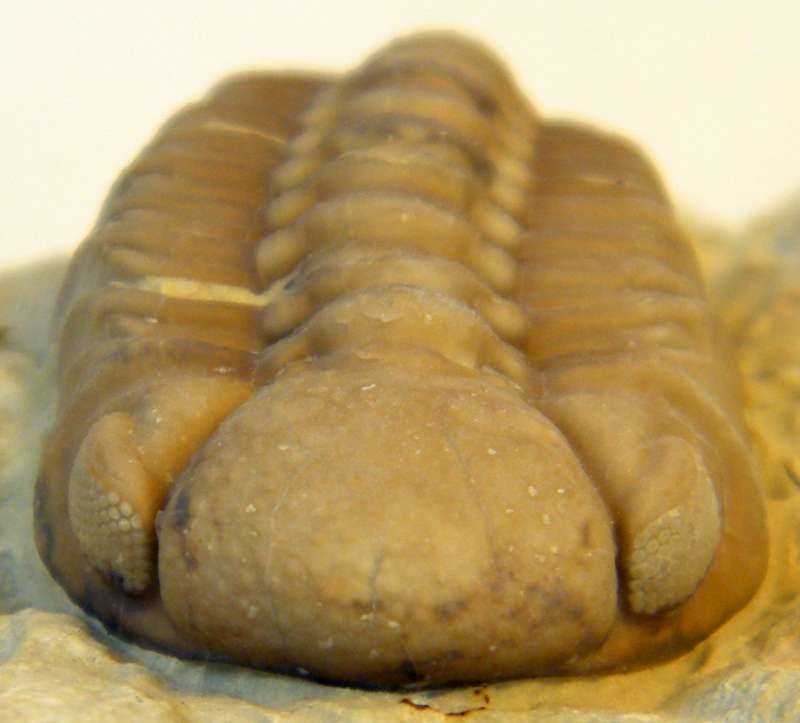 The phacopids are a diverse and common group of trilobites at Black Cat Mountain, ranging in size from less than a centimeter in length to almost 15. Two superfamilies are represented, the Phacopoidea and Dalmanitoidea. Both of their species are technically in the suborder Phacopina whose members are distinguished from all other trilobites by their eyes. The schizochroal structure of these eyes is exemplified in the photograph of two dalmanitid heads provided by Bill Rushlau, shown to the right. Notice how the individual lenses are discernible in the photograph? In the alternative eye structure, known as holochroal, it is virtually impossible to distinguish the individual lenses without high magnification; they are much more compactly spaced on the visual surface and a single corneal layer covers them all. Incidentally, the specimen on the right in the photograph was only recently uncovered and represents a new, undescribed species from Black Cat Mountain. The specimen on the left is typical of the eye structure found on dalmanitids usually found there. 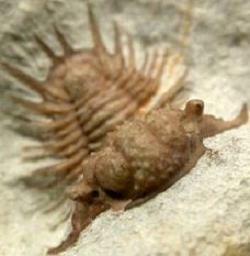 For interesting news on the eyes of these trilobites, see the March 14, 2013 article in Science Magazine. While isopods are clearly not trilobites, sequential segmentation is common in both groups. In the following link is a video showing modern deep sea isopods scavenging a whale carcase, which may be vaguely reminiscent of trilobite behavior. In this link, one can almost imagine phacopoids cleaning up the sea floor in similar fashion. Though some researchers have suggested that these particular trilobites may have been predatory, we know that many predators today also scavenge when they get hungry enough.